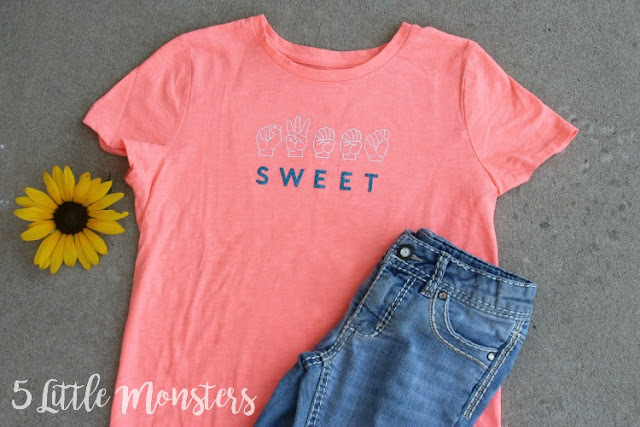 I am really excited to share another t-shirt collection collaborations with Cricut. Last month I shared my inspirational t-shirt collection and I really loved how those shirts turned out, but today's collections has special meaning for me. 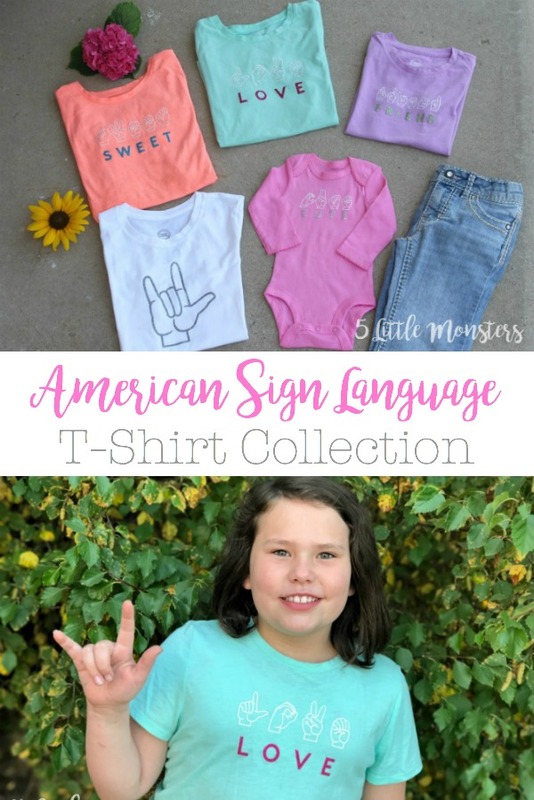 This set is American Sign Language themed, using ASL handshapes to spell out words. This shirt collection is inspired by my kids. 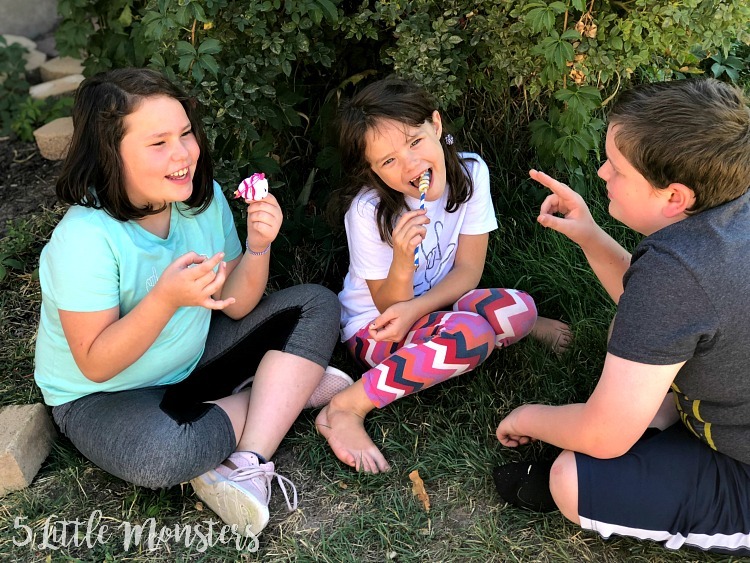 If you know me personally or have been following my blog for a while you may be aware of the fact that 3 of my 6 kids are deaf, my oldest son and 2 of my girls. I have shared a couple ASL themed projects in the past like a crocheted ASL I Love You, an ASL Jewelry Holder, embroidered onesies, and ASL reading pillows. ASL will always have a special place in my heart because it has allowed me to be able to communicate with my children. My oldest son was late identified, with newborn hearing screenings most deaf babies are diagnosed shortly after birth, but my kids have a progressive hearing loss that in his case was not caught by the screening. He was almost 2 when his little sister was born and we found out she was deaf. He wasn't talking yet so we decided to get his hearing checked. We were shocked to find that he was profoundly deaf. 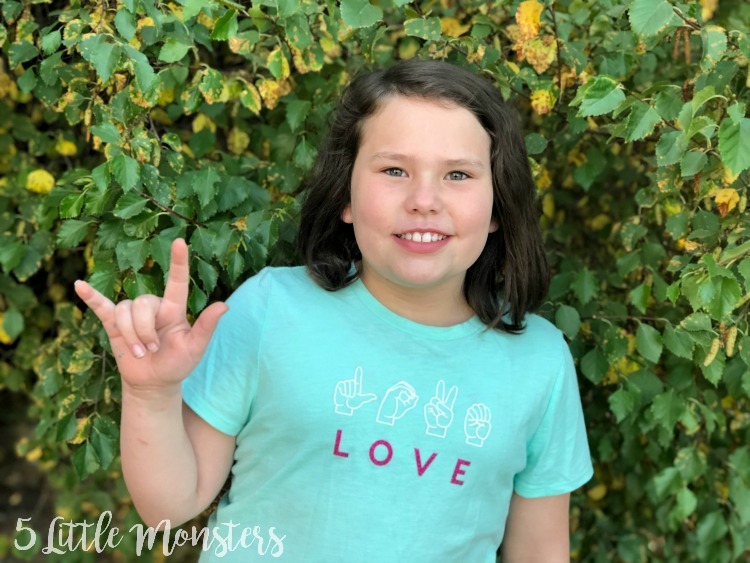 We started learning a little bit of sign language right away, we started by watching Signing Time videos before moving on to classes, early intervention, and deaf mentors. We thought he was just a really quiet kid and it was amazing to see the change in him as he was introduced to sign language and his world opened up now that he had a way to communicate. He had so much to tell us, he just need a way to express himself and ASL gave him that. 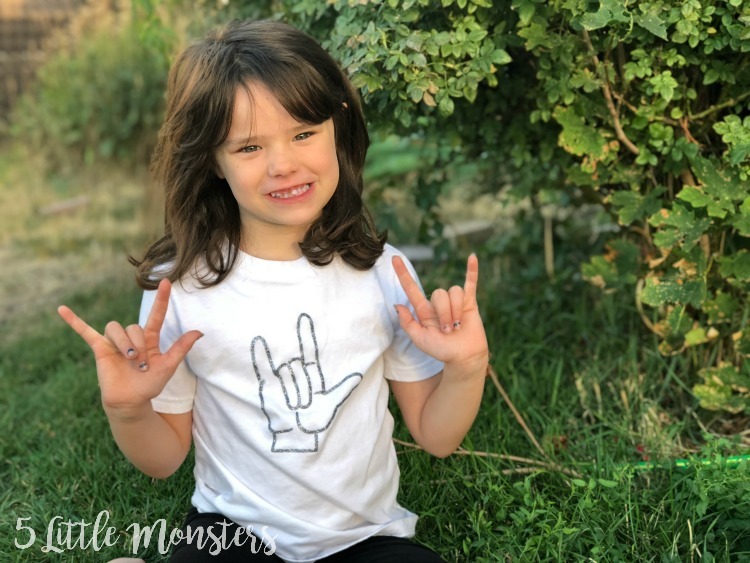 All 3 of our deaf children continue to use ASL as at least one form of communication, and as a family we have continued to learn and use ASL in our home. 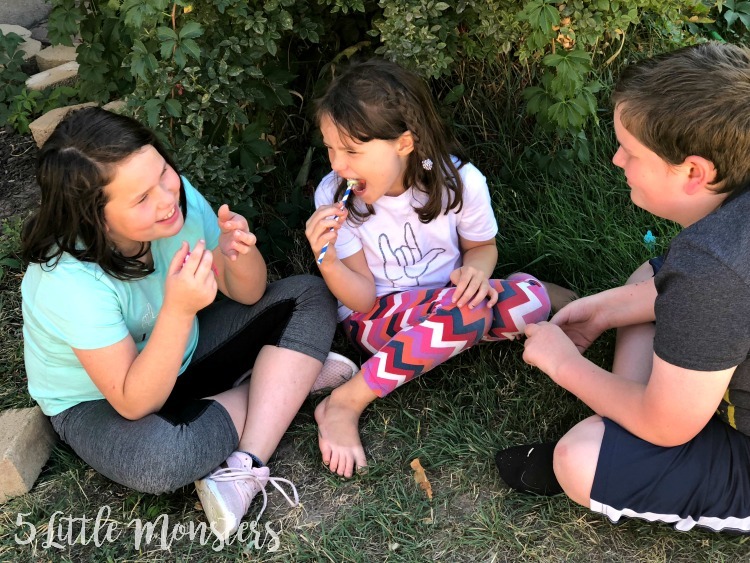 It is fun to see even our 2 year old sign to his deaf siblings, he already understands at least on some level that that is the way they communicate and he needs to sign when he wants to talk to them. 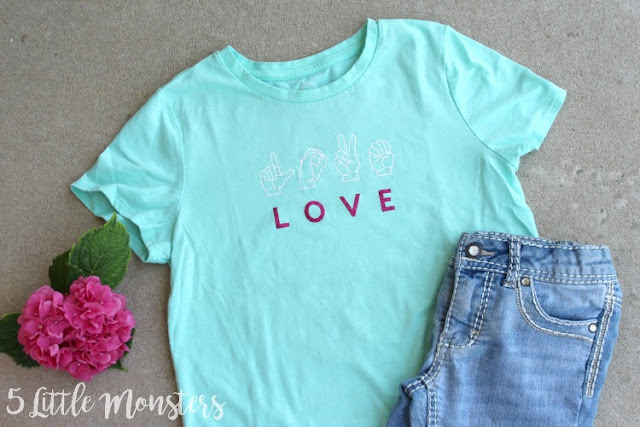 To make these shirts I chose a few different words and spelled them out with ASL fingerspelling and then put the corresponding letters below. I chose 4 words: Love, Cute, Sweet, and Friend. 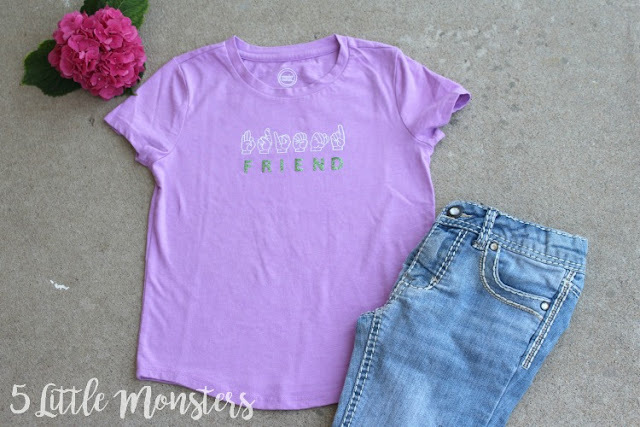 For those 4 shirt I cut the handshapes out of white Everyday Iron On and the the letters out of Glitter Iron On, each shirt in a different color. 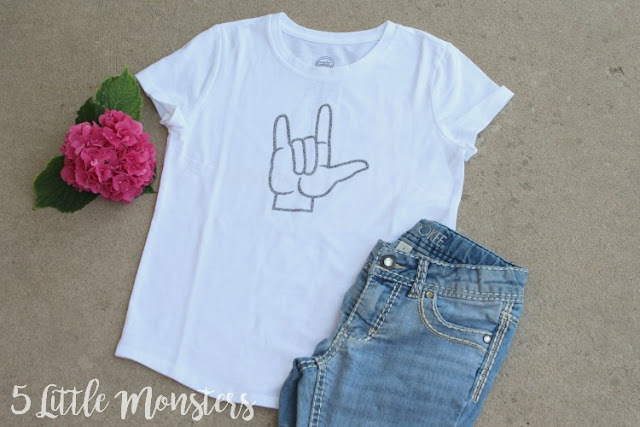 The last shirt I made was an I Love You handshape, it doesn't have any words on it but the sign in much larger than on the other shirts and it is cut out of black silver Glitter Iron On. 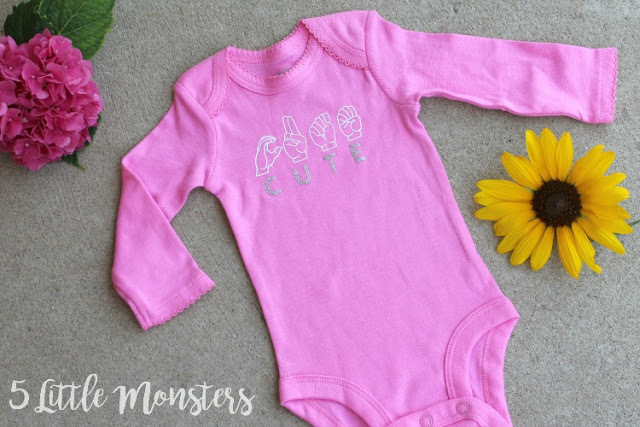 I put the CUTE design on a baby bodysuit because I thought that one in particular would be perfect for a baby. 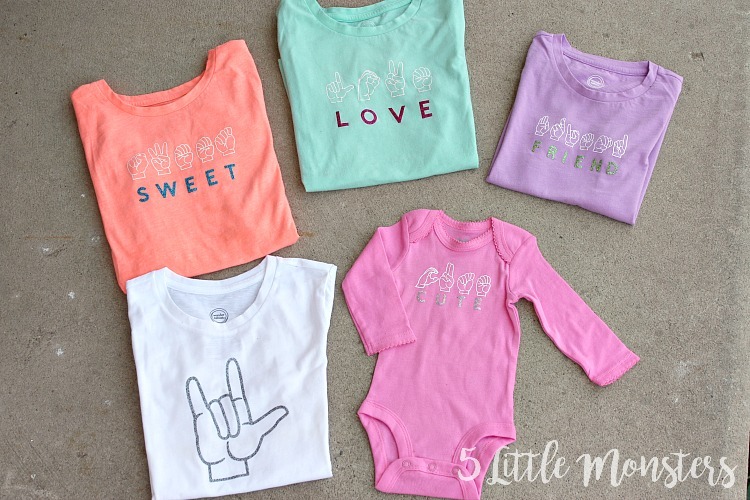 The others I did on kid size shirts to fit my girls. Any of them could be easily adjusted to fit on any size shirt. 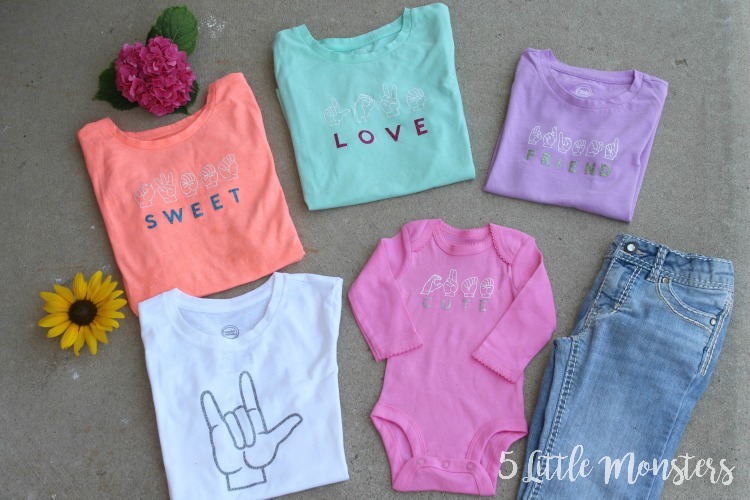 With the new EasyPress 2 sizes the smallest one is sized perfectly for baby bodysuits and it is large enough to make the kid sizes of these shirts too. 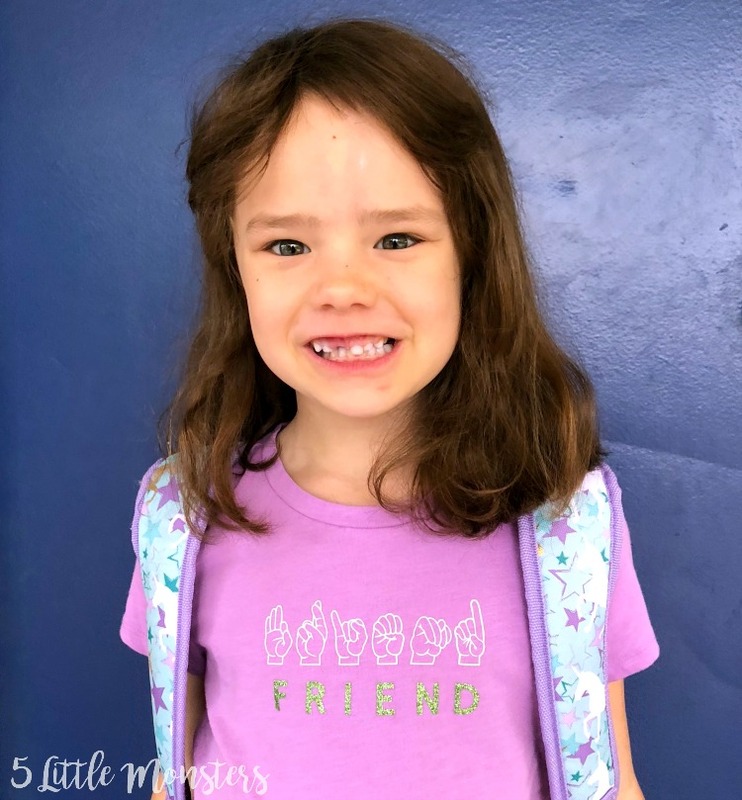 Each of the shirts are available in the project section of Cricut Design Space, you can look for them there or click the links below to go directly to each shirt. I hope you enjoy this new collection!